Double Chocolate Swirl Bundt Cake is decadent and delicious! Now I know what you’re thinking. Am I dreaming? 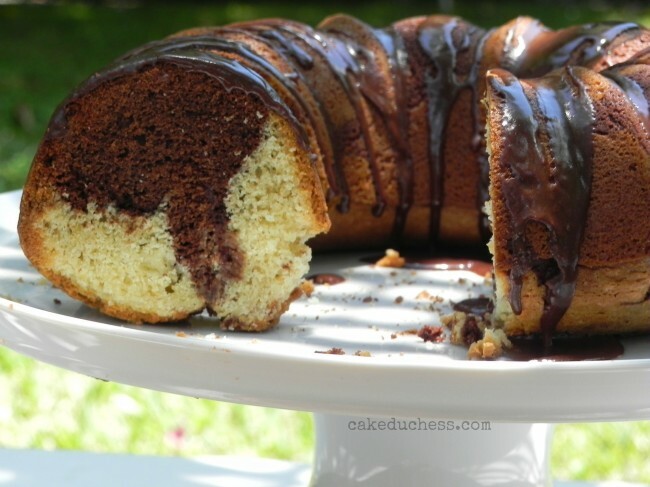 Double chocolate swirls in a bundt cake? Yes…it’s happening! Swirls are just too pretty to look at in cakes. They may make them almost too pretty to dig into. Almost! I was thrilled when it was time to think about a swirly cake for June’s #BundtaMonth. The possibilities were endless. I honestly was swirling in the direction of something fruity. But I just made a berrilicious bundt last month. It had to be something different. How about a streusel swirl? Yes, that would be incredible. I had that problem again. I was dreaming about a cake I saw in the May issue of Cooking Light. I still didn’t get to the strawberry pound cake they featured. I immediately baked the chocolate one. I even baked this cake for Swirly June weeks ahead. That rarely happens…I guess the swirls were too difficult to resist! some notes on the cake: I’ve seen some people say they don’t know how to create the swirl or they’re afraid to do it. It is a really simple technique with such pretty results. As long as you have your two batters ready to go in your pan, you just gently create some swirls with a butter knife. Then you let the baking magic do the work and soon you will have a gorgeous and very swirly cake! I smoothed down the batter with a spatula after I swirled around with the knife. Combine first 3 ingredients in a large bowl; beat with a mixer at medium speed until light and fluffy. Add eggs, beating until incorporated. Stir in 1/2 teaspoon vanilla. In a large bowl, combine flours, powder, soda, and salt. In a small bowl, combine sour cream and 1/4 cup milk. Add flour mixture and sour cream mixture alternately to butter mixture, beginning and ending with flour mixture. Stop mixture to scrape down the sides of the bowl with a spatula to incorporate all the ingredients. Combine 1 teaspoon canola oil and chopped bittersweet chocolate in a microwave-safe dish. Microwave at HIGH for 1 minute, stirring every 20 seconds until smooth. Stir in 2 tablespoons cocoa and the espresso. (if you don’t have a microwave like me…do this with a double boiler over medium heat). Remove 2 1/2 cups vanilla batter; add to chocolate mixture, and stir. Spoon in the batters alternately to the bundt pan. With a butter knife, gently swirl the batters together. Not too many swirls or you will ruin the pretty design. Bake for 50-55 minutes or until a wooden pick inserted in center comes out clean. Cool cake in pan 15 minutes. Remove from pan; cool on wire rack. Combine powdered sugar, 2 tablespoons milk, 1 tablespoon cocoa, 1/4 teaspoon vanilla, and 1/8 teaspoon salt; stir until smooth. Drizzle glaze over cake. Woah! Does this look good. That glaze on top totally elevates this to drool worthy levels. 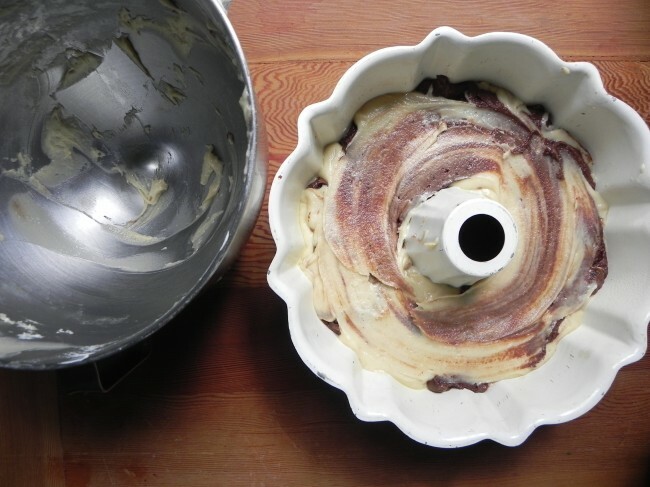 Marbled Bundt cakes are my favorite and I was just going to bake one when another electricity cut happened. Now I am feeling motivated again! =) Thanks for sharing Lora. Love bundt cakes AND swirly cakes. This right here is a winner! 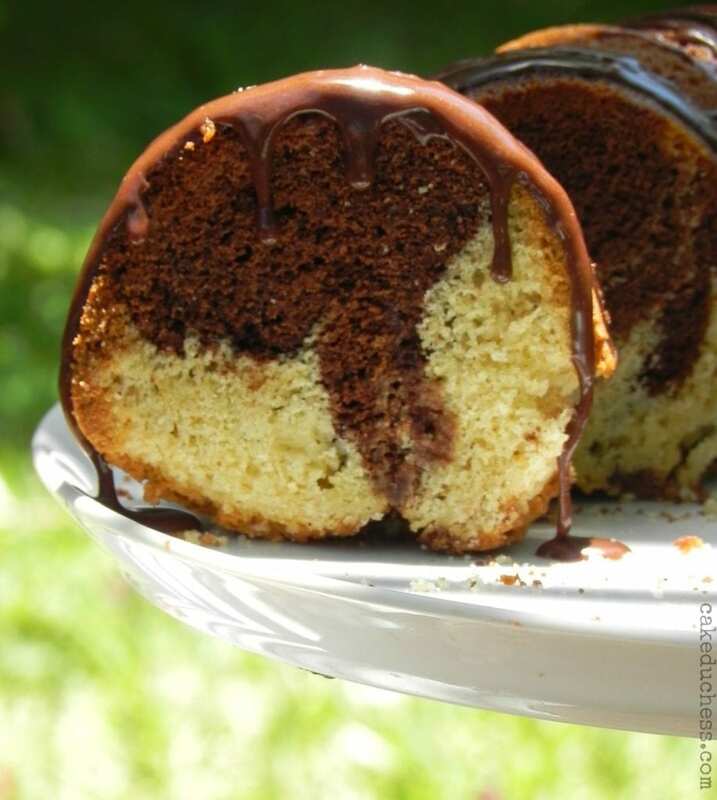 Your marbled bundt cake looks soooo delicious! It's making me crave cake at 8:30 in the morning. There's nothing better than chocolate and vanilla together! Love the chocolate glaze to amp up the chocolate factor. Beautiful! I just want to stare at that first photo of the chocolate dripping down the cake slice all day. Of course, it would be even better if I was eating the slice while looking at the photo too. Double chocolate = double good! Your cakes are always beautiful and I especially love to see your Bundt versions. You can never go wrong with chocolate, especially with a little espresso powder to kick it up a notch. OMG, I LOVE this method!!! wow, what a great idea! I'm going to try this when I attempt a swirl again!!! this is so lovely and beautiful! and all of your photos are gorgeous, LOVE! You are the best, Lora! Not only is double chocolate always a good idea, a dash of espresso never hurts =) Your instructional about swirls is truly helpful, too. Thank you! The words 'double chocolate' made me happy. 🙂 That looks ridiculously delicious! This looks so moist and delicious!!! Beautiful photos! Your cake looks delicious! It must be the swirls. Of course, chocolate icing puts it over the top. This is the kind of two tone cake I grew up with and it´s still one of my favorites. And with some espresso and whole wheat flour in the mix, even better! This cakes are so perfect to have around, and they dissappear fast too. Have a great weekend Lora! Lora, that looks divine girl!! Perfection!! Gah! I need a thick slice of this bundt, stat! It's gorgeous, Lora – the contrast between light and dark, with that decadent glaze on top…I'm actually salivating right now, no joke. I love that you threw in espresso – I always add instant coffee to anything chocolate. I find that it amps up the chocolate flavour without adding too much coffee. This is decadence at it's finest in a bundt. What a gorgeous cake and the swirls are perfection. Whenever I try to 'marbelize' batters..they always look like a beautiful kaleidoscope that someone stepped on! Well..it's been a while..will have to eventually try again, and this cake would be the perfect place to start! The chocolate glaze is calling to me! Yes please to double chocolate; love that swirl! That cake caught my eye in Cooking Light too. So glad you made it and the glaze really pushes this cake over the top! You gave us a great month of swirl baking, thanks!!! You've outdone yourself Lora, this looks wonderful! Love that chocolate glaze dripping down, i want to take my finger and make a swipe! I like your technique for making the swirl. I'll have to try that next time. 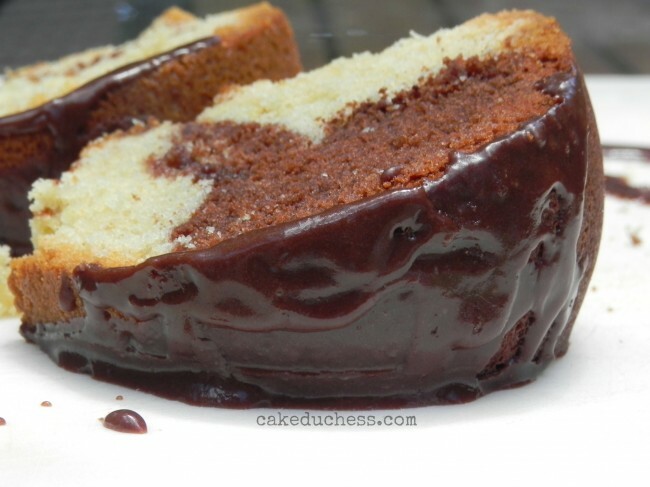 That glaze looks incredible on your cake! Very nice swirling! Mmm… chocolate. I like a little touch of coffee/espresso in mine, too, just to develop the flavor a little more. Beautiful! The glaze really pulls it together. Three cheers for a double chocolate swirl!!! 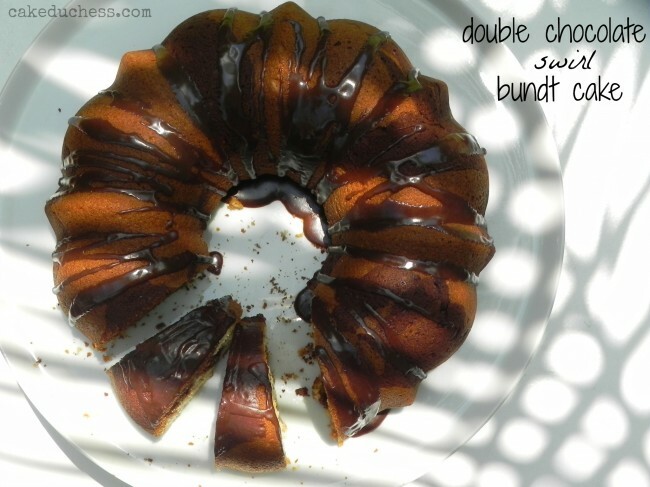 Swirly double chocolate bundt- not sure it gets better than this! Your bundt cake sounds delicious. What a beautiful cake! 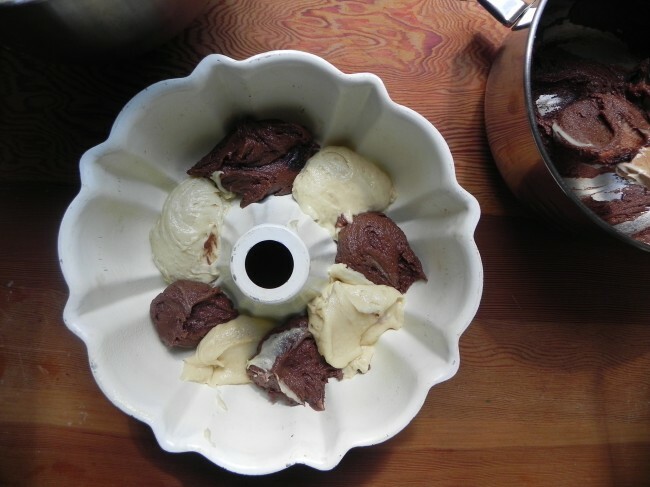 I love bundt cakes to serve for guests and adding extra chocolate is even better!